It's interesting to see the approach VR puzzle games have taken so far. Besides a few puzzles in exploration games the true puzzle games I've played so far are Waterbears VR and Fantastic Contraption. Waterbears VR isn't groundbreaking, but it adds a level of immersion that you don't get from most puzzle games. This is a typical "use the pipes to direct the liquid flow to the correct place" type of game, but it is pretty cool to be able to walk around the puzzle while viewing and interacting with it using your hands. It's very intuitive and makes it much more worthwhile than this game would be on a flat screen. 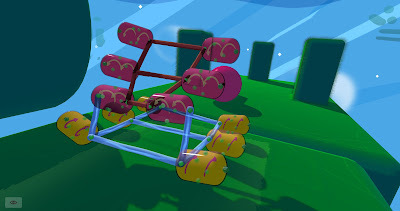 Fantastic Contraption on the other hand feels like it could only be done in VR. You're given tools and some workspace and you have to create fantastic contraptions (get it?) to get a special orb into the goal. You have connection points and different types of materials to work with but the sense of space and perspective is truly needed for this game. I can't imagine it on a flat screen. I'm interested to see what other developers do with puzzle games in the future in VR. I feel like the space still has tons of room to be explored.